I made this vinaigrette a couple weeks ago with organic basil for my Green Lentil Salad (not on the blog…yet) and it was amazing and so flavorful. So this week I was craving my favorite soup, The Soup (on the blog) and because that recipe is heavy in Asian flavors I thought why not try this dressing with cilantro?! I know that people either love cilantro or hate cilantro, so feel free to use basil or parsley. But for me this vinaigrette was spot on for my salads this week for lunches. I also thing this recipe would be great as a veggie dip, for you your kids or your picky significant other. Enjoy! 1. In a food processor or blender, blend the miso, olive oil, apple cider vinegar, water and brown rice syrup until well blended. 2. Add the chopped green onions and cilantro and pulse lightly to blend. 3. Pour into container with tight fitting lid and refrigerate for just a few hours for flavors to develop. *Cilantro: Helps eliminate the heavy metal build up of mercury and lead from the bones and tissues in the body. Oooo! I have all the ingredients for this at home! Definitely making this one! 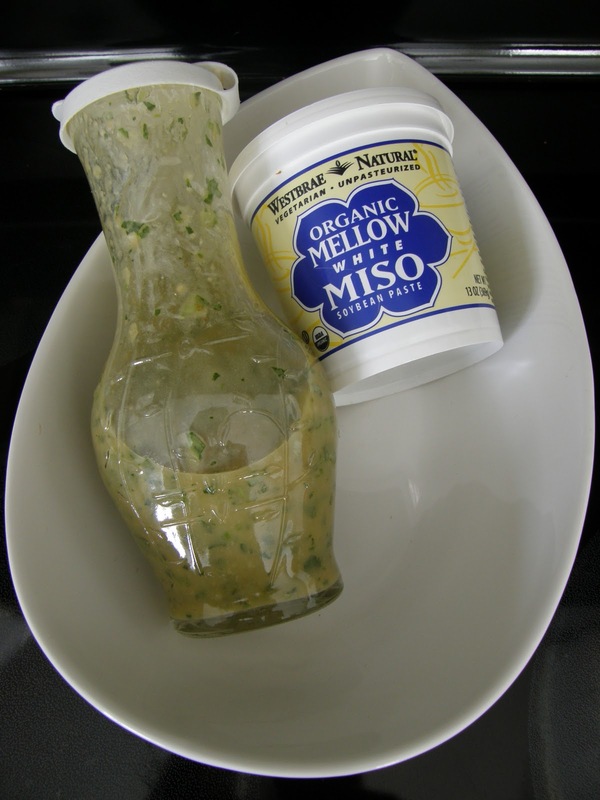 This dressing is awesome and can be made with differant herbs.